Now ain't this a kick in the head....Bowe Bergdahl keeps declining phone calls from his family. And even with his family having been so vocal and active these past five years in trying to secure his release, Bowe Bergdahl continues to say that he's NOT yet ready to speak with them even though it's been more than a week since his release, and that seems quite odd as he is free to do so at any time. But when your father still sports the beard of the enemy after saying he'd shave it off upon his son's release...and after he utters words praising allah on national television for all to hear...you just know that something is just NOT 'kosher' as they say. Now add in that Bergdahl’s sister sent him a letter and he has NOT yet responded to that either, and this whole Bergdahl 'dog and pony show' becomes even odder. 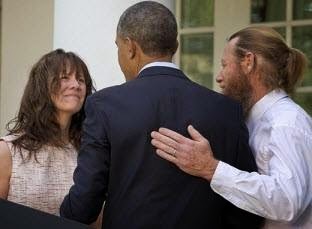 Odd indeed as everything surrounding Bowe Bergdahl's sudden release from captivity is an enigma starting with Obama's 'supposed' reason for securing his release at the time he did. Remember, the Obama administration claimed that immediate action was necessary to get Bowe home because of reports...reports from whom is still a question that remains unanswered...that his health had significantly declined, yet now it seems that aside from some minor gum and skin issues...NOT unexpected as you just know the Taliban never heard of soap and water or a toothbrush simply by looking at them...Bergdahl is apparently in good overall health, and is in NO way malnourished as he appeared to be in videos the Taliban made and released of him late last year. In fact, some reports are saying he looks better physically than he did on the day he, of his own free will, walked away to join the enemy in jihad. How convenient that Kerry forgets to speak of or even care about the countless American troops his boss's actions have been put in danger of their possibly being tortured or having their heads cut off... but hey, what does that matter as long as the brethren are happy, and with this deal you just know that they are happy indeed. But the bottom line is that Bowe Bergdahl did desert both his post and his fellow soldiers, and that at least eight of ours died looking for him. And so Bergdahl must be held accountable, called to task, and punished...YES punished...for his traitorous actions. 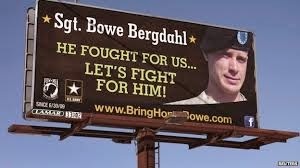 Yet even with the bottom line there is more...much more...to the Bergdahl story then we are being told and it involves Bob Bergdahl, a man whose actions and sympathizes most definitely side with the very people who held his son captive these five long years. 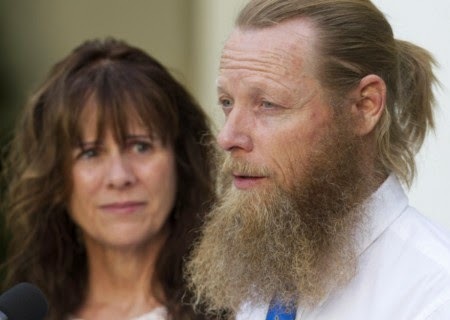 Held his son captive we have been told, but being Bowe's obviously good physical condition could... and I only say could...could Bob Bergdahl have set his son up to do his own bidding...to align himself through Bowe with America's enemy. There is a trail of evidence that does point in that direction and it goes even deeper than Bob Begdahl's infamous tweets (and there have been close to 5,000 of them) that have since been removed, and it goes even deeper than his blasphemous words praising allah...words in reality that speak of islam's victory and sanctity that had Obama smiling as he said them. The very man who early on went on the internet...went on the social media...to criticize Obama and his lack of actions in trying to secure his son's release is now Obama's buddy complete with hugs and kisses for the camera. The very man who back in 2013 made a video for the Pakistani government thanking them for their sacrifices...what sacrifices I wonder...and then thanking the Taliban themselves for their sacrifices...thanking the very ones holding his son...is a red flag that all is NOT right with this man. 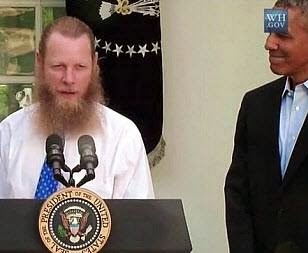 And while we know that Bob Bergdahl was in contact with some in Afghanistan during the years of his son's captivity, what was NOT well-known was that Bob Bergdahl, in a 2013 interview with a local Idaho newspaper (Idaho Mountain Express) said that he felt that exchanging GITMO prisoners for his son was something he considered a win-win situation for America...and that retrieving a missing soldier but NOT saying Bowe's name...how odd is that...would foster good will with the Afghan people. Since when does a loyal American father whose son is 'supposedly' held captive by the enemy care about fostering good will with the enemy...and he knew damn well that those holding Bowe were the Taliban...as in the enemy...an enemy holding his son in Pakistan. Loyal to America Bob Bergdahl was NOT then nor is he now, and his appearance to date gives visual proof as to where his true loyalties lie. So is Bob Bergdahl a traitor like his son or is he the Svengali who molded his son...pulled his son's strings into turning his back on America. 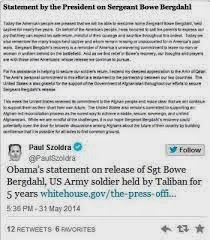 I believe he is both as much as I believe Bowe Bergdahl is a traitor...a new breed of American traitor whose family played on 'We the Peoples' sympathizes and cost at least six true American heroes their lives and for that punishment must be swift and just...and just has any meanings as you dear reader well know. 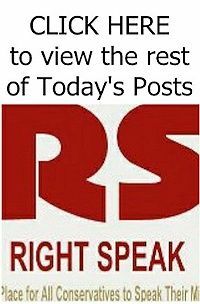 As many of you know my RIGHT SIDE PATRIOT partner and friend, Craig Andresen, is in facebook jail until June 26th, so I have been posting his articles for him. 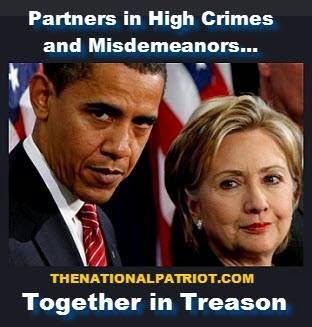 Please click this link: http://www.thenationalpatriot.com/2014/06/09/partners-in-high-crimes-together-in-treason/ to go directly to Craig's blog 'The National Patriot' to read his newest article. All we need is 100,000 signatures to force this regime to address our concerns!!! Your information and research are needed. Thank you for the nice work. Keep it up!